This is impressive. Classically inspired, this is still vivaciously cutting edge and lethal. Any fan of Heavy Metal already likes most of the elements present in HAUNT’s sound as referenced in other forms and arrangements originally by other artists. Studio tricks have homogenized recordings to the point of functioning as a menacing form of eugenics. It is through the true identity of a band that the audience is enabled to bond. Imperfection is another dimension of character in an artist’s profile. The honesty vocally is truly endearing as it constantly fights for betterment. With “Burst into Flames” being the band’s first full-length release, it is striking to encounter the staggering amount of aggressive Heavy Metal character contained within. The first track, the title track, ignites the proceedings with classic dual guitar harmonies that deliver a powerful melody combined. The verse section introduces clean, standard Heavy Metal and NWOBHM vocals. Underneath is a grimy, though not quite Sludge-flavored bass that is constantly galloping and marching on. While the vocals are nowhere near Halford r King Diamond, they not divisive as they use classic melodies with a subtle flare for non-radical vocals akin to those of classic URIAH HEEP or BLUE OYSTER CULT. THIN LIZZY and HAUNT frequent the same musical territories often, though Church cannot keep up with Phil Lynott vocally despite his unique charm. “Crystal Ball” which plays next, has the swagger of IRON MAIDEN’s “Revelations”. That undeniably fist-pumping nature nails the aesthetics. This is the point where it is clear that it’s on. Those five or six shots have kept you form leaving but perhaps that was the point all along. It was undeniably destined to happen. “My Mirage,” the fourth track, opens with that huge Les Paul on the neck pickup with the tone rolled off harmonizing with another with a thumping bouncing bass line underneath a la THIN LIZZY. The solo section toward the middle certifies the band is legit. It would not be a proper review if the seventh track, “Heroes,” was not mentioned for it really does not get much better than this. The dual guitar melody that starts the song is like a hyper fusion of “Somewhere in Time”-era IRON MIADEN and “Fatal Portrait”-era KING DIAMOND. This reviewer definitely grew up on the same tapes as Mr. Church. Once again, the band the turns to the beloved double-picking style of the 1980s such as Jake E. Lee’s most popular tunes. When the guitars return to their harmonies, the listener is treated to an earful of true Metal bass playing full of unique character and solid delivery. Matthew Wilhoit plays some riffs that mirror those of Steve Harris but he has a bit more bite in his tone. The guitar tone could not be more 1980s-sounding as it is clearly a Marshall JCM 800or a derivative thereof and a Tube Screamer. The harmonies exchanged between those axe-wielders are stunningly slamming, and the solos rival the classic feeling conveyed by Adrian Smith, Dave Murray, and Andy LaRocque. While remaining mindfully vintage, the one instrument that benefited most from modern technology was the drums. They don’t sound different, but the spectrum is widened yielding more swing and attack because of modern bass drum pedals, drum heads, and condenser microphones. The saying “$100 goes a lot further these days” rings true when it comes to music gear as well as computers. Technology is truly what drives the market. For those in the know, the fact that HAUNT is a solo project of Trevor William Church from BEASTMAKER practically sells the album itself. He is joined by John William Tucker as well From BEEASTMAKER on guitar. There is no hidden agenda as HAUNT wear their influences on their denim jackets. Perhaps what is most endearing is the way the band incorporates essentially all the “good parts” of classic, traditional Metal along with the way they write their own songs with their own character. All of this yields a band that is ultimately solid, enjoyable and transcending of genre and age. 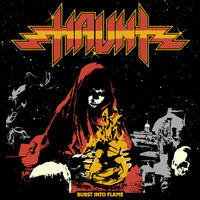 In the current scene of Traditional Heavy Metal and the revival of NWOBHM along with the hybridization of everything else, HAUNT is at the forefront, transcending while widening the very definition of Heavy Metal.